A stable, affordable, reusable and easy to manufacture membrane for gas separation with applications in natural gas, hydrogen, petrochemicals and other gases From a cellulose-based precursor and in a single carbonization step it was obtained a CMSM that displays no pore blockage in the presence of water vapor and controlled oxygen chemisorption and displaying very high ideal selectivities and permeabilities. Unprecedented results were obtained without pre- nor post-treatments steps during CMSM production. 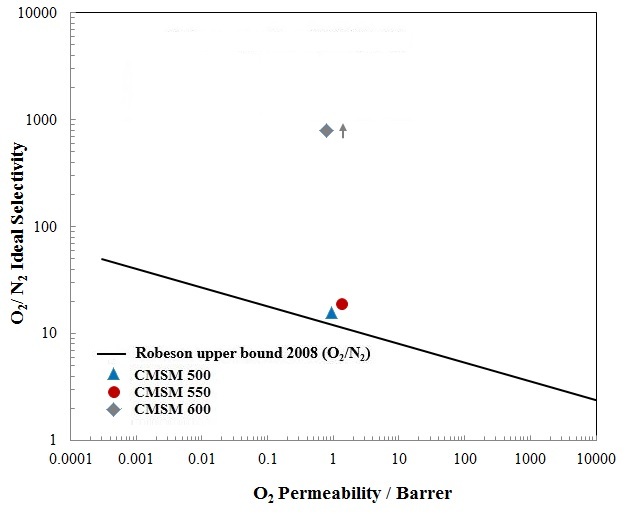 Carbon molecular sieve membranes (CMSM) are a very promising technology for gas separation, exhibiting simultaneously high permeabilities and selectivities. However, all reported and disclosed CMSMs suffer pore blockage in the presence of water vapour, normally above 30 % of relative humidity (RH), and display oxygen chemisorption that severely impairs the performance of the membranes. Competing technologies for gas separations are polymer membranes, adsorption based processes, cryogenic distillation and gas absorption, with their known drawbacks and high costs. 1 - Shows no pore blockage in presence of humidified gas mixtures (up to ca. 80 % RH). Previous state of the art show no pore blockage only for RH up to ca. 30 %. 2 - Shows no performance aging in presence of oxygen after a simple post-treament process..
3 - The precursor used is from a renewable source and of very low price. 5 - Unprecedented ideal selectivities, well above the current state of the art. 6 – Enables the production of tailor made membranes for each application. These CMSM can be used for industrial applications such as nitrogen and oxygen gas separation, separation of hydrogen from syngas, removal of CO2 from the natural gas wells, recover of hydrogen from natural gas, CO2 separation from flue gas, air dehumidification, natural gas dehydration, helium recovery/separation and xenon separation from gas mixtures.